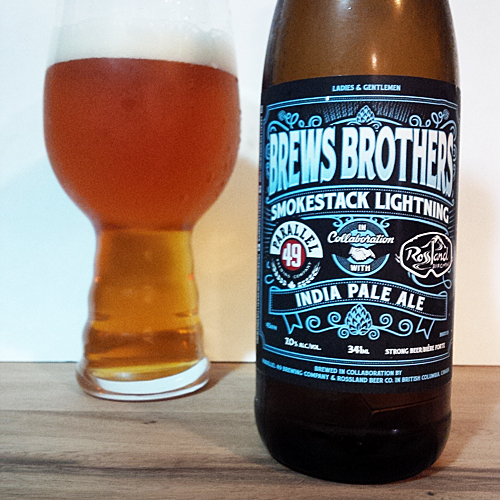 Parallel 49 Brews Brothers: A first of its kind in BC, the Brews Brothers 12 pack is a large multi-brewer BC collaboration pack of beers that were brewed together at the Parallel 49 brewery in Vancouver, BC. This variety pack of beer, which retailed for $25-$30 in stores across BC and Alberta, is likely all sold out at this point, but there may be a few kicking around here and there if you are lucky enough to find one. Personally I was stunned when I saw this was coming out, since the amount of effort to coordinate and produce this is so huge that I wasn’t sure it could be done right now in our smaller, but quickly growing craft beer culture. The only other similar effort I am aware of was Beer Camp, which was lead by the massive craft brewery Sierra Nevada, and was widely distributed in the USA accompanied by a multi-location beer fest across 7 cities. Needless to say it was pretty cool, unique and something I know I had to buy, consume and review on this blog. 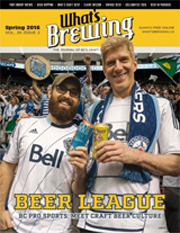 A Little Bit About Brews Brothers: Luckily, I had a chance to sit down with Graham With (head brewer and process engineer at Parallel 49) recently to chat about the concept, the project and some of the inner workings of this insane accomplishment. When I asked him about how it all started, you could tell that he was thinking back to some simple words that were blurted out, which after spoken turned a simple idea into a ridiculous amount work, coordination and awesomeness; it became BC’s first super collaboration 12 pack of beer. Imagine some brewers and friends sitting around working their way through at least a case of Sierra Nevada’s Beer Camp and blurting out the words “hey, we could do this”. From what I’ve been told that’s about how it happened, as it all started with a simple idea of ‘why couldn’t we do this in BC?’ which was a question that apparently hadn’t been asked in the right setting until now. The concept turned into a project that celebrates BC beer, allowing consumers to try 12 different craft brewed beers, by 12 different brewers (13 if you count Parallel 49) in a wickedly sweet 12 pack beer experience. It’s like a tour of BC beer, from Vancouver Island all the way to The Kootneys in Rossland, BC. The variety in this pack ensures that there’s a little something for everybody with a pretty cool blues theme and design to support it. Get it, a little something for everybody! The Process: These types of projects take an enormous amount of planning and there’s a huge logistics challenge with making them and keeping them fresh, while at the same time coordinating with all the visiting brewers. Parallel 49 made one last use of their six 5000L fermenters for this colossal project, which just so happened to be right number of fermenters to reasonably brew 12 different beers over a short 9-10 week period of time. They started with the beers that were to be lagered or wouldn’t be hurt by a few extra weeks in storage to get the first batch done so those could go through their process while the second batches of the hoppier beers were brewed last since they are generally better fresher. Each brewer visited Parallel 49 to brew the beers together, and the visitors were given serious creative control over what they wanted to make, how it was made, the ingredients, and overall were able to work their own unique brewing characteristics into each release. Graham remarked for example that the Dageraad Table Saison, tasted a lot like a Dageraad brewed beer (and I agree), which was a big part of the intention of this collaboration pack. Brewing in Collaboration: From what I understand, these were brewed together in person with all the brewers except Rossland, who did it via a terrible Skype connection and a few cellphones on speakerphone huddled together as they couldn’t quite make it out here for brew day. Now, collaborations aren’t just about brewing beer together, they are also a chance for brewers to get acquainted with each other, to learn from each other and of course to later enjoy some liquid inspired fun afterwards. I can only begin to imagine the other potential ideas that came up during these brew days, because when innovative people get together the creative juices get flowing and ideas come out left right and center. The visiting brewers all helped pick out the classic blues songs to inspire their creations and the music was blasting on brew day, drinks were flowing and good times were to be had in this intensely unique collaborative brewing experience. You’ll have to talk to the brewers yourselves for more details beyond that, because what happens on brew day stays in brew day! My Overall Impression: I love the idea of the project and I thought thy executed it quite well. There was lots of variety in this pack, including many different styles that reflected what each brewery is known for producing while adding some collaborative flair to each beer. Some of the beers were one’s I’d buy again no problem, some were decent and a couple were just alright, but I had a great experience trying them all which was the main point of the Brew Brothers effort. For the price and the variety, I felt that I overwhelmingly got a great deal and the beers totally lived up to the excitement around the project. Please check out my reviews below (in brewery alphabetical order) of the 12 beers in the Brew Brothers Collaboration Mixer Pack and let me know which one was your favourite of the bunch in the comments section. 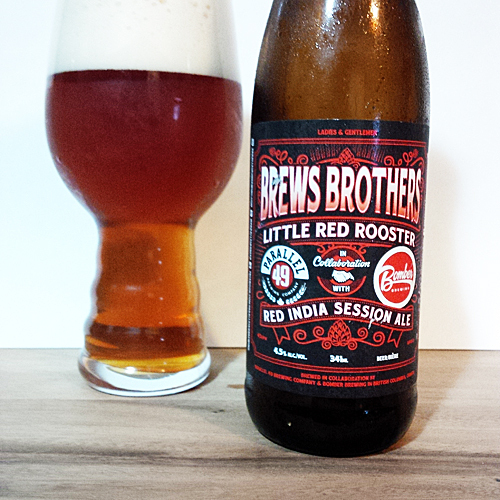 Little Red Rooster: A collaboration with Bomber Brewing in Vancouver, BC who is grounded in hockey, friendship and beer, this Session IPA is brewed to a strength of 4.5% abv in the red bottle pictured above. Aroma and Appearance: It pours a copper colour with 3 fingers of foam and an average level of carbonation. The aroma is mostly grapefruit, tangerine and some doughy malt. Flavour: Some tangerine citrus up front is followed by an hint of dough malt, some caramel and a finish of grapefruit citrus and floral hops. Overall Impression: A little thin on the hop flavours which sometimes happens with this style but otherwise decent and it goes down easy. Nice intro to craft beer for those scared of the so called “hoppy” beers. Rating: Above average at 6.5/10, I’m not a huge session IPA fan to be honest so I am a bit hard to impress when it comes to these. The Thrill Is Gone: A collaboration with Brassneck Brewing in Vancouver, BC who only serves their beer on tap or growler fills at the brewery for the most part.. This beer is a Pilsner that is brewed to a strength of 6.5% abv with an apparent mix of new world and old world hops in it. Aroma and Appearance: Pours a clear straw colour with one finger of white foam and a low level of carbonation. Its aroma is light hay, lemon and some cereal grains. Flavour: Some light corn and hay flavours, with some spicy hops upfront, a clean middle and a crisp finish that has a bit of hop bite with lemon on the aftertaste. Overall Impression: I was a little dissapointed that they did a Pilsner, Brassneck makes so many good funky and creative beers and they never bottle them, so I thought this was a missed opportunity to do something more interesting. Rating: Above average at 6/10, nothing special going on here but certainly refreshing and drinkable. House of the Rising Sun: A collaboration with Dageraad Brewing in Burnaby, BC who is focused on crafting traditional Belgian style beers, but closer to home for us so we can taste some authentic to style beer that is fresh and hasn’t traveled thousands of miles to get here. This is a Table Saison, which is a session strength 4.5% abv beer that I see as the equivalent to table wine in France, something you can drink everyday with a meal, that isn’t too strong (traditionally less actually, like 1-2%), but doesn’t shy away on flavour. 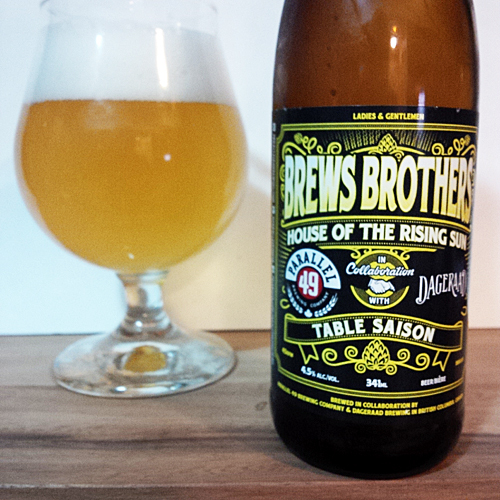 Aroma and Appearance: Pours a pale yellow colour with 3 fingers off bubbly white foam and lots of carbonation. The aroma is pepper, floral, hay like and it has a hint of clove spice. Flavour: Subtle straw and hay upfront, with grains and pepper in the middle and a hint of lemon and clove on the finish. Overall Impression: Very nice, Belgian style tafelbier is my favourite sessionable style of beer. It doesn’t ever feel thin, the flavour is always nice and spicey and the low alcohol makes it enjoyably sessional. Rating: Very good at 7.5/10, I hope this becomes the summer Burnabarian (hint to Ben), I would gladly fill some growlers of this for summer shenanigans. One Bourbon, One Scotch, One Beer: A collaboration with Firehall Brewery in Oliver, BC who is located in the middle of BC wine country outside of Osoyoos just past the Golden Mile (finally somewhere for us beer geeks to go!). This is a smoked Scotch Ale that contains a partial corn mash, was aged in Bourbon Barrels and was an attempt to make incorporate all 3 of each classic drinks in the song title to make it a very unique beer. Aroma and Appearance: Pours a copper amber colour with a thin layer of foam and no visible bubbles. 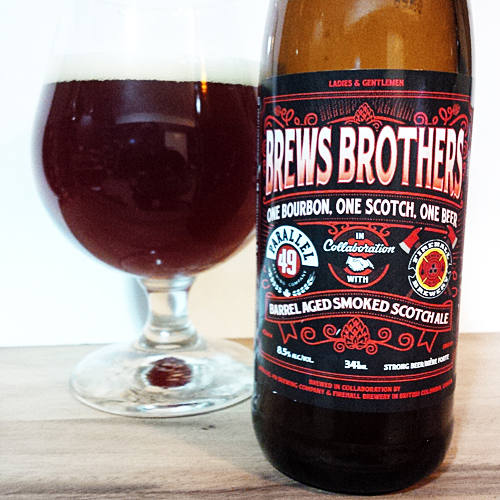 Its aroma was slightly smokey bacon, a hint of sour mash and grains. Flavour: Very subtle sour mash, like a bourbon with some oak, some smokey peaty malt like a scotch and some grains and hints of fruity malts like a typical scotch ale with a finish that reminded me a lot of Makers Mark. Overall Impression: My first bottle had gone bad, something wasn’t right with it that was extenuated by the treatment of our lovely BC Liquor Distribution board and honestly I dumped it. I reached out to the brewers who went to a lot of effort to replace my bottle with one that happened to have been cold stored since production which was way better tasting. I am rating that bottle (the good one) as it was representative of what they were going for and tasted quite nice. Rating: Very good at 7.5/10, I’d love to see them attempt something like this again at some point, especially with all those wine barrels sitting around out there from the 20 or so wineries near Oliver, BC. 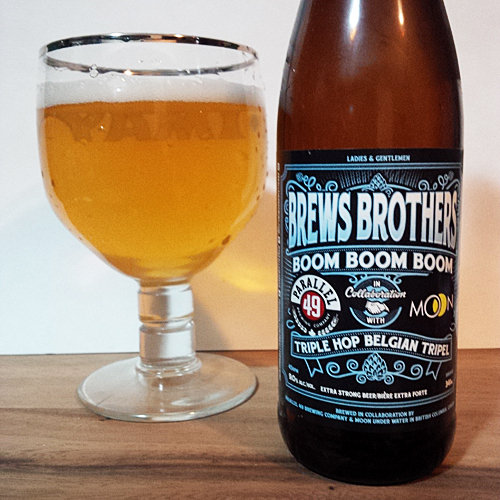 Boom Boom Boom: A collaboration with Moon Under Water Brewery in Victoria, BC representing Vancouver Island which has a long history of brewing quality beer. This is a 9% abv Belgian Tripel that is well hopped and rounds out the collaboration pack quite nicely with fairly malt forward style of beer. Aroma and Appearance: Pours a golden yellow colour with one small finger of foam and some centered bubbles. The aroma is sweet pears, banana, a bit of apple and wisps of sweet caramel. Flavour: Fairly sweet beginning with pears and caramel that move into over ripe banana in the middle with a finish that has cloves, more banana and has apple on the aftertaste. Overall Impression: Quality basic Tripel, I didn’t get any hops presence whatsoever beyond balancing out the sweetness a little bit, but otherwise it was good. Rating: Very good at 7/10, simple but tasty and well balanced for 9% abv. 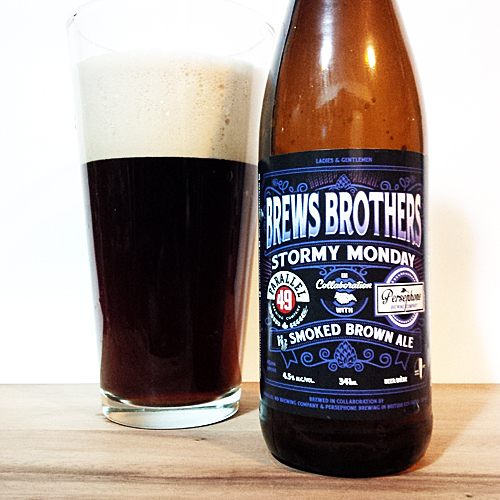 Stormy Monday: A collaboration with Persephone Brewing in Gibsons, BC representing part of the Sunshine Coast (one of the most beautiful parts of BC) this place is a short ferry ride away from West Vancouver that can be cycled to, albeit uphill on the way there. This beer is a Smoked Brown Ale brewed to a strength of 4.5% and uses Nitrogen for carbonation instead of CO2, which is best poured completely inverted to create a super cool cascade effect in your glass and whole lot of creamy foam. Aroma and Appearance: Pours a medium brown colour after a long admirable cascade of foam that settles in the 3-4 finger range and has a flat texture. The aroma is smoke, meat and nuts. Flavour: Quite nutty and meaty upfront, it has a creamy texture with hickory smoked middle and a slightly earthy dry finish and smooth silky mouth feel. Overall Impression: Impressive work with the smoke and nitro, better than expected and unique. Rating: Very good at 7/10, nice beer that was worth trying. 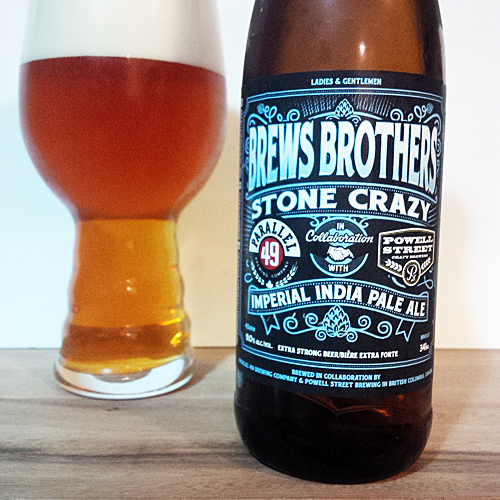 Stone Crazy: A collaboration with Powell Street Brewery in Vancouver, BC who is a few blocks away from Parallel 49 and is famous for their Beer of the Year winning Old Jalopy Pale Ale. Now, Powell nearly blew my socks off with their recent Imperial IPA called Right Kind of Crazy, so I was pretty excited to try this subsequent 9% abv Imperial IPA release. Aroma and Appearance: Pours an orange copper colour with three fingers of foam and some slow rising bubbles. Its aroma is loaded with sweetbread dough, tangerine citrus, grapefruit, lemon and tea leaves. Flavour: Lovely sweet doughy malt upfront, it has a big tangerine citrus middle accompanied by some lemon and tea leaves before moving into fruity nectarines and huge resinous bitterness that hangs around for a while. Overall Impression: I thought this was halfway between Old Jalopy and Right Kind of Crazy, nice malts and hops combo and one of the best in the pack. Rating: Excellent at 8/10, many people agreed with me on this one that is was in the top 3 of the 12 pack. Smokestack Lightning: A collaboration with Rossland Beer Company in Rossland, BC which is a small town with a population of about 3500 people located in the Kootney’s region of our province. A strange phenomenon in BC that is happening in the craft beer world is that brewers in these small towns are opening up and becoming so popular that most of their sales are local, even in very small towns like this one. This is great for the local economy and tourism because it gives you more of a reason to take the southern loop past Rossland or Trail on your way to Nelson or Southern Alberta if you don’t live in the area. This is an IPA brewed to a strength of 7% abv and it was cool to be able to try something from this place. Aroma and Appearance: Pours a copper colour with medium carbonation and one finger of foam. The aroma is tangerine, caramel and orange. Flavour: A bit of sweet doughy malt and orange citrus upfront, it has some caramel and lemon in the middle with a herbal bitter finish and residual malt tones. Overall Impression: Good basic IPA, likely perfect for the town they are located in as it is approachable and a bit safe but still tasty. Rating: Above average at 6/10, just enough to keep me interested. 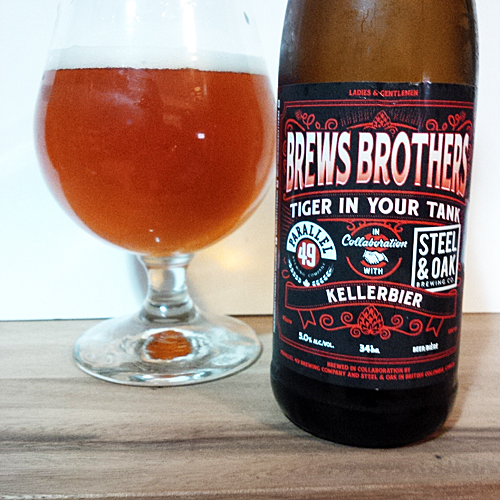 Tiger in Your Tank: A collaboration with Steel & Oak in New Wesminster, BC this is the only brewery in that part of town who was so popular that they actually ran out of beer for a short period of time soon after they opened. They are known for some of their smoked lagers and hefeweizens, so it’s no surprise that they made a smoked Kellerbier which is brewed to a strength of 5% abv. Aroma and Appearance: Pours a clear copper colour with a small layer of foam and very low carbonation. The aroma is slight citrus fruit, grains and wisps of smoke. Flavour: Slightly smokey upfront, it has some cereal grain flavours in the middle accompanied by a creamy mouth feel and is followed by a meaty smoked finish that teases hints of lemongrass. Overall Impression: Interesting style, they make a wonderful Red Pilsner which I would have loved to have seen a smoked version of but this one was neat too. Rating: Above average at 6.5/10, pretty light in flavour but the smoke made it interesting. Backdoor Man: A collaboration with Storm Brewing in Vancouver, BC located fairly close to Parallel 49, this place has been operating for 20 years in a funky building that represents the types of beers they make which are wild, crazy and inventive. This is a basil infused IPA that is brewed to a strength of 6.5% abv and represents the wild array of beers you’ll often see at the brewery (recently including creations such as Apple Pie Ale, Pineapple Sour, Cinnamon Bun Ale, Ginger Lime Pilsner). Honestly, if you can think it and eat it, Storm has probably made a beer out of it and it probably tasted much better than you expected it would. Aroma and Appearance: Pours a clear copper colour with one finger of foam and an average level of carbonation. The aroma is minty fresh basil, garden herbs and it will remind you of the produce section of your local grocery store. 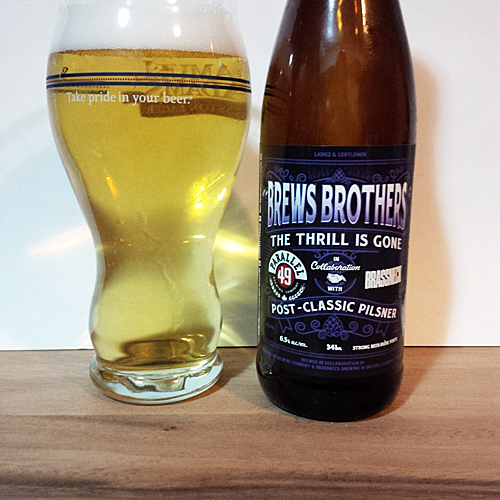 Flavour: Very herbal upfront, the basil plays a big accentuated role throughout this whole beer. It is minty, with some sweet caramel in the middle, doughy malts and a finish that is bitter and grassy with of course, more basil. Overall Impression: Weird, but works, which is a great way to describe their beers and this one is no different. Rating: Very good at 7.5/10, this was a big hit with lots of other people and I enjoyed it myself too. 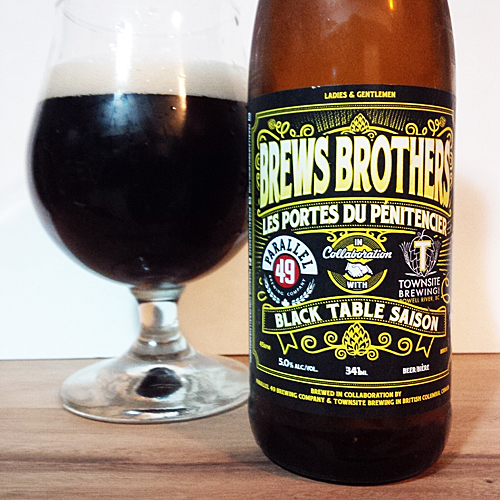 Les Portes du Pénitencier: A collaboration with Townsite Brewing in Powell River, BC another Sunshine Coast small town brewery where the majority of their beer sales are local, this place is run by a married couple who are both trained brewers with experience in the industry. This beer, named after a song called Prison Gates but in french, is a Black Table Saison brewed to a strength of 5% abv. It represents the brewery well, as their head brewed has a Beer Engineering degree from Brussels, Belgium and they make a lot of Belgian inspired beers. Aroma and Appearance: Pours a dark ruby brown colour with one finger of foam and some centered bubbles. Its aroma is mildly toasty with hints of pepper. Flavour: Roasted grains with pepper and herbal spicy hops upfront, this beer highlights some cloves in the middle with nuts on the finish and a noticeable light effervescent mouth feel. Overall Impression: Nice work on this one, a unique style that I hope to see more of in the future. Hound Dog: A collaboration with Yellow Dog Brewing in Port Moody, BC who has themed their brewery and beers around canine culture, including bone shaped taster trays and beers named after dogisms like “Shake A Paw Porter” who won Best in Show at the local BC Beer Awards this year. This is a Belgian IPA brewed to a strength of 6% abv, named again after a blues song with the word dog in it and in a style I tend to enjoy quite a bit. Aroma and Appearance: Pours a copper gold colour with one finger of foam and just a few bubbles here and there. Its aroma is big on the citrus notes, featuring lots of lemon, tangerine and orange juice with wafts of traditional Belgian yeasty cloves on the side. Flavour: Big fruity citrus notes upfront, it has some cloves and biscuit malts in the middle mixed in with some nectarines and a lemon-lime citrus bitter finish that warms your throat as it goes down, revealing mild spices and hints of coriander on the aftertaste. 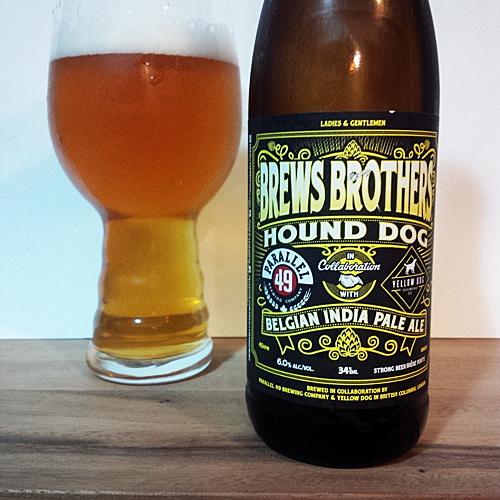 Overall Impression: My favourite of the bunch as it’s doggone delicious! Rating: Awesome at 8.5/10, enjoyable spice and citrus hop combo that worked perfectly. What did you think? Please let me know your thoughts on this one like which was your favourite? Did you have any disappointments? Please share some comments below and in the meantime enjoy some of my favourite clips from the hilarious Blues Brothers movie. 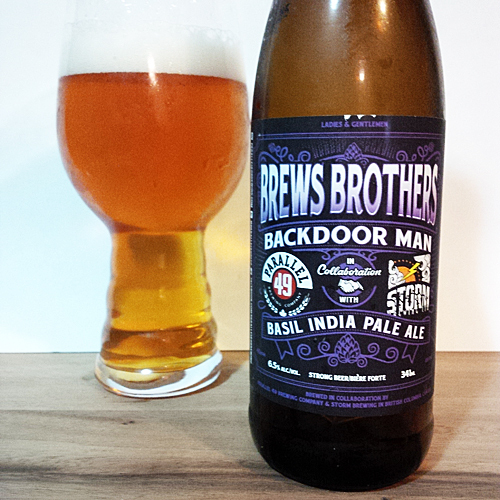 For the backdoor man just head over to Storm Brewing the next time he does a Basil IPA. It’s pretty darn close to the same beer. Yeah, seems like it was hit and miss for people. Pretty cool idea though, hope they do it again next year! I would be surprised if they did as from what I heard they used their smaller tanks for this project. As soon as the project was done they sold those tanks off. Holy hell that’s one big post! 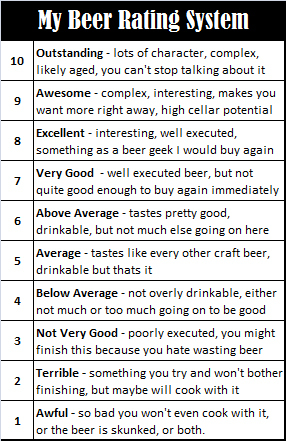 I agree on most of your reviews of the beer and was quite happy with all the beers I have had so far. I do have a few to drink still. I think you forgot that Powell Street Craft Brewery was the first local brewery to continuously run out of beer. They usually only had beer for half a week at a time. White Rock Beach Beer Company also runs out of beer usually on day two of selling it. I’m sure they’ll do it again, just with twice the amount based on the sales! It sounded like they ended up having to release a ton of singles at the tasting room so I wonder about overall sales. They have now even sent them to Manitoba and they had stopped sending their one and only beer there. I had the barrel aged smoked ale as part of the package and realised it was off a gulps into it. I actually became physically ill!! Not a fan of smokey beer but the rest of the package was great. Yikes on the barrel one, I like certain smokey beers but not all of them. The nitro one was pretty nice and unique.